Since its the new year I think its time for a clear out and a change up of my most used makeup (I get a bit stuck in my ways sometimes) So i'm going to show you what I have decided to keep and use as my everyday makeup. Dive in with me. I was a little scared of this primer before I tried it because iv never actually used a compacted primer before, I was a bit sceptical but now that iv given it a fair chance I love it! You would think by looking at it that it would leave a white cast on your face but if you blend it out with a brush or your fingers it blends into the skin perfectly! The main thing that I love about this primer is that it keeps my skin looking matte all day (which is what I need!!) and it helps my makeup look flawless on my skin. I rarely like to use powder foundations because I like a medium to full coverage and I find it quite hard to actually find a powder foundation that actually gives me that! but this one does. This foundation is a 4 in 1 product which means that its a Foundation, Powder, Concealer and SPF. I also like to use this foundation in different ways, firstly if iv decided to use a liquid foundation as a base then i'll apply this powder to give my skin a matte look and then for my everyday makeup look I apply my chosen concealers and then layer this foundation. Now I have two concealers which will never leave my daily makeup bag and that is Collection and Maybelline. I have probably been using these two concealers for years on and off. I have tried different products but I always come back to these concealers. Firstly Collection Lasting Perfection, I use this concealer for all over the face concealing, on blemishes and spot scars (do not pick your spot guys!) and it hides them perfectly. The Maybelline Eraser Eye is literally perfection. 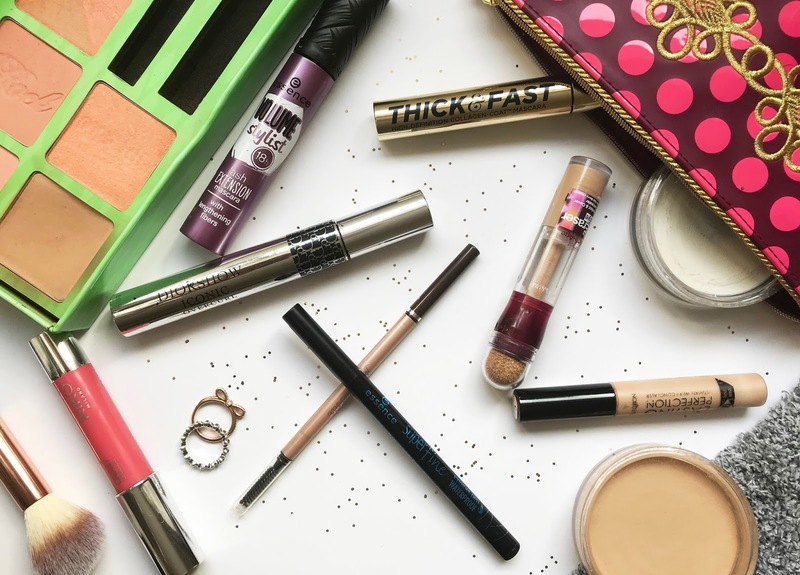 I have tried so many under eye concealers. and they always without fail crease! but there is a light at the end of the tunnel and this concealer doesn't. Two Christmases ago I got a beneift gift set which I have recently rediscovered and have been using everyday! The Hoola Bronzer is probably my favourite bronzer because it isn't too light for me (I have a medium skin tone) or too orange which happens a lot. It has really good blendibility and leaves me looking sun kissed in January. The first thing I liked about the Rockateur blush is the smell, I cant really explain hoe amazing it is but it smells like heaven. The colour also gives you a rosey glow without it looking too heavy. I only ever really wear a small amount during the day and with this blush you can layer it to give you your desired look. I don't wear liquid eyeliner on a daily basis but when I do I always go for essence superfine liner. The tip of the liner brush is a felt tip and it is fin enough that it creates the perfect winged liner easily and it doesn't take hours! I dont really go for waterproof versions of products but for this one it is a necessity, the normal version of the liner is that it stays sticky but the waterproof version dries right away and stays on all day. I'm not sure if anybody else does this but I use three different mascaras on a daily basis. One for curling, one for giving volume and the other for separating my lower lashes. Firstly I use the Soap & Glory mascara all over my upper lashes, this is the mascara that gives me the curling effect, then after this I will use the Essence one for adding volume and thickening the lashes and then lastly I like to use the Dior Overcurl for my lower lashes. Iv tried a few different combinations of mascara and this one seems to work for me the best. I still haven't been able to find a single mascara that does everything i'm looking for, The quest conditions. I have has problems before with trying to find the right shade for my eyebrows because I have such dark eyebrows but this Jane Iredale retractable pencil is the perfect shade for me and it isn't too light so it looks silly. Another thing I love about this product is that it isn't too dry where you feel like your pulling at your skin which I hate! I have used different eyebrow products like pomades and powders bit I think retractable pencils are the easiest to use. For Everyday use I lobe to use Lip Crayons, they are easy to use and this particular crayon leaves the lips looking like i'm wearing lipgloss. The colour of this lip crayon is slightly pink which I dont tend to wear that often but this colour is so flattering and would look lovely on all skin tones. When the glossyness of this crayon goes away it also leaves a nice tint to the lips and keeps the lips moisturised which is always a plus! If you have any suggestions of any products that I could add to my daily makeup bag feel free to comment also what are your favourite products.